Buying camo golf carts that have been used is kind of like buying a pre-owned car. You will want to take your camouflage golf cart for a drive, give it a thorough inspection, and find out if it’s in your budget to purchase it. You will want to do these things to make sure the cart doesn’t break down within a couple of weeks of buying it. You will also want to do research about the certain cart you plan on buying, so you’ll be more knowledgeable when you run the maintenance tests it should go through. This will assure you that you have received the best deal possible. Today there are many places where you can buy pre-owned camo golf carts. Just like buying a car, you can buy directly from private owners, or you can buy from dealers who sell golf carts. If you are new to camo golf carts and don’t have a lot of knowledge about them, you should bring along someone knows a fair amount of knowledge about golf carts. Bring someone along that knows a lot about golf carts, will make sure you get a cart the best fits your needs. 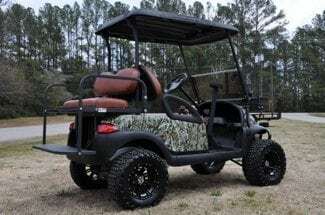 As you may already know, since you’re looking for camo golf carts to go hunting, the majority of golf carts are not just for riding on a golf course. The majority of golf carts can be used on the streets as well. Many people who buy golf carts for recreational use, living areas where they are able to drive to the course. There are many of these communities in the United States, with a few being built each year. The number of communities that allow golf carts to be driven streets is expected to increase largely due to the baby boomers aging. If you live close to the forest or woods. You may be able to ride your camo golf carts to the area where you plan on going hunting. Driving your golf cart to the woods will save you time from unloading from a truck. You have to make sure that when you buy your golf cart it is designed for both the woods and the road. There are some golf carts that are made exclusively for hunting. These carts have the car lifted so they can easily go over rocks and other things that a normal golf cart would get stuck in. The last thing you want to happen is getting your golf cart stuck somewhere in the woods. This is especially true if you’re by yourself, because it would take much longer time to get yourself unstuck. You may be able to find camouflage golf carts at a hunting store that sells ATVs. If you are unable to find a golf cart that is camouflaged at the store, you can always buy a camo golf cart from a dealership. You would then be able to upgrade the original golf cart to a hunting one and camouflage it yourself. It is a pretty easy process to camouflage your own golf cart. The one thing that you can do is by vinyl covering and buy seats that are camouflage. You can also buy a golf cart cover that is camouflaged in order to aid in your hunting. Getting camo golf carts for hunting is a good idea you want to decrease the travel time it takes to get to your favorite hunting spot. The main thing you want to do with the golf cart when you buy one is make sure that it is camouflaged. You’ll also want to make sure that you lift your golf cart, so you don’t get stuck in the woods.